One of the key objectives of China’s new health system reform is to improve equality and effectiveness of public health functions and services. 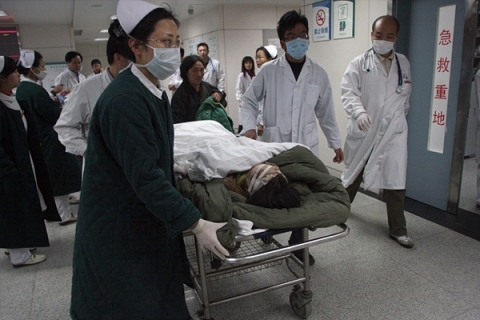 Since health reform was launched in 2009, the central and local governments have allocated RMB 15 Yuan per person to support public health programs. That level of funding has now increased to RMB 25 Yuan in 2012. One slogan used in China’s health sector is “Equalization of public health functions and services among different places of China.” Has such an objective been achieved or is it at least on the right track? From my point of view, under the current fiscal decentralization system it would be formidably difficult to improve equity in public health between the developed and developing regions of China. Although the central government has developed policies to ensure that central and western parts of China receive a minimum of RMB 25 per capita from both the central and local governments, the gap between eastern coastal areas and western inland has continued to increase. For example, the Shanghai Municipal Government has allocated RMB 70-80 Yuan per person for public health services in recent years. Therefore, it is not surprising to see that the public health services offered there are significantly improved and much better than that provided at central and western parts of China. Another challenge in the implementation of China’s public health reform is the lack of detailed guidelines on the effective use of funds to implement public health interventions. RMB 25 per person per year is not a lot of money for a district or county in China. The Ministry of Health has developed a long list of public health functions and services that local health authorities and/or the CDC can do with the funds allocated to them. Several years ago, I worked on a DFID-funded health policy project in Weifang City in Shandong Province, and visited several community health centers. These community health centers, often responsible for a catchment area of as many as 2,000 individuals, received RMB 10 Yuan per capita for public health interventions. The local health authorities required these community health centers to offer up to 56 interventions, including non-communicable disease case management (e.g. hypertension, diabetes), infectious disease control (e.g. TB), health promotion and education, etc. It was nearly impossible for these community health centers to implement all these interventions, given such modest financial resources and lack of qualified personnel. A recent article published by the Bulletin of WHO also reported that village doctors did not find the financial subsides for the provision of public health services to be sufficient remuneration for their efforts. My advice to China’s Ministry of Health is to work with different regions to prioritize the public health interventions based on their cost-effectiveness and the growing burden of disease. In addition, the central government should increase the financial resources provided to the poor regions to support effective public health programs. Otherwise, I cannot see how equity in public health functions and services in China can be improved.